Conservative MP Blake Richards said he is feeling confident about his bill that would make it a crime to wear a mask during a riot. MPs debated the private member's bill in the House of Commons Wednesday evening, the second time it has been debated since it was introduced last fall. MPs will vote on second reading for the bill next Wednesday. "Obviously private member's bills … traditionally there are not a huge number that make it into law, but I'm actually quite confident that this one will," Richards said in an interview Wednesday ahead of the debate. The Alberta MP's bill, first debated in November, seeks to amend the Criminal Code so that it would be an offence to wear a disguise while participating in a riot or an unlawful assembly. It is already illegal to take part in a riot or unlawful assembly, but this bill would create a separate offence related to wearing a disguise while participating. Richards has said his bill targets those who try to disrupt peaceful and lawful assemblies and turn them into riots, and that the legislation would help prevent violent situations from erupting. It would help protect the right to protest peacefully, according to Richards. He has been drumming up support for his bill since the fall, particularly among the business communities in Toronto and Vancouver. Toronto experienced a riot during the G20 meeting it hosted in June 2010, and a year later Vancouver had a riot following its Stanley Cup final loss. Vancouver's downtown business association passed a resolution in support of the bill, and Richards said he has support from police chiefs in Vancouver, Calgary, Toronto and other cities. There is "widespread support" from MPs in the Conservative caucus, and Richards said he's heard a positive response from some Liberal MPs, though the NDP is opposed. In his remarks during Wednesday's debate, Richards said he will appeal to MPs who represent ridings with urban business communities and who have constituents affected by riots in the past. His bill includes an exemption for wearing a face covering with a "lawful excuse." That would include religious or medical reasons, Richards said, and the burden of proof would be on the person to prove he or she is concealing his or her identity for a legitimate purpose. 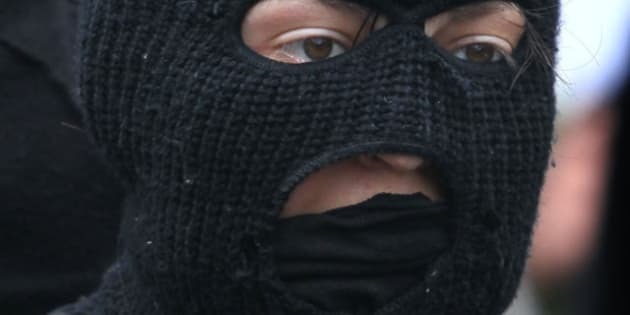 If it were to become law, a violation would mean a maximum penalty of five years imprisonment, but Richards said during debate that he is open to increasing that to 10 to bring it in line with the existing Criminal Code offences related to wearing a disguise. The Criminal Code currently has a penalty for wearing a disguise with the intent to commit a crime, but according to Richards it is challenging to apply and can only be applied after an incident occurs. He said police have no power to deal pre-emptively with people who are concealing their identities while a situation is unfolding. If his plan succeeds, police would have the power to order the removal of a face covering. The Canadian Civil Liberties Association has expressed doubts about the constitutionality of the bill and expects it would be challenged. "I think it is more a symbolic bill than it is a response," Natalie Des Rosiers, general counsel with the group said last fall. "In our view, it shouldn't come into law, it has no demonstration of a need for this." Bill C-309 could be voted upon next week, and if it gets enough support, it could move on to the committee stage. Votes on private member's bills are generally not whipped, meaning MPs are free to vote however they choose and do not have to stick to a party line on a particular issue. Richards said he hopes the NDP and Liberals will allow a free vote. "I'm quite confident that I would be able to see this through to law," said Richards.